“Behold. The master at work,” says Ben Vereen of bassist/composer Tom Kennedy. 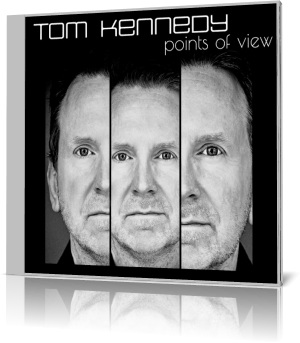 He’s not exaggerating, as Kennedy exhibits his mastery of the instrument and of composition with Points of View (2017). Kennedy plays electric bass, acoustic bass and keyboards. Personnel are Dave Weckl, drums; Bill Evans, soprano sax; Charles Blenzig, piano; Karla Harris, vocal on “New July”; Wes Ritenour, drums; Chuck Loeb, guitar; Bob Fanceschini, soprano sax, tenor sax; Lee Ritenour, guitar; Obed Calvaire, drums; Nick Marcione, trumpet; Randy Brecker, trumpet; Mike Stern, guitar; Richie Morales, drums; and Bob Malack, tenor sax. Weckl and Kennedy begin “The Dark” in emphatic fashion, injecting a slight Weather Report touch. After the intro, the mood changes to something more mellow. Evans takes lead, setting the mood for an evening of romance. The tenor expresses freely, with Weckl and Blenzig offering support. Kennedy evokes memories of Jaco Pastorius when playing in the background. During his middle solo, he makes the instrument talk, much like a suitor saying sweet nothings to his darling. At just above eight and a half minutes, it’s the second-longest track in the set. That gives the listener ample time to enjoy each musician individually, and the quartet as a whole. Lee Ritenour takes point on a song he wrote, “Just Listen.” His son, Wes, is on drums. The tune is like a hybrid of something contemporary, typical Rit, and a throwback to what one might expect from Wes Montgomery, one of Ritenour’s heroes. Kennedy plays acoustic bass on this one, and Franceschini joins on tenor. This piece is aptly titled. Rather than dance, snap fingers or tap toes, one is inspired to kick back, close the eyes and hear the music for all its worth. The first half of the album consists of songs by other composers, including Ritenour’s contribution. Kennedy wrote the final four. Each track Five of the tracks are with a quartet, with two a quintet and one a sextet. The musicians move in and out, with Blanzig appearing on all but one song. Wes Ritenour has drum duties on three tracks, with Weckl and Calvaire contributing two each and Morales on the closer. Franceschini plays soprano on two and tenor on two, with Evans performing one song per instrument. The others only appear once each.